It will not have escaped your notice that cricket bears a stark similarity to life, birth, life, death; the dread cycle becomes in, innings, out. A fellow’s professional career predicts his life as his style at the crease reveals his character. I should know, I’ve been at it these 16 years. As a matter of fact l’ve entered the third part of my career. I am a wily old pro. Each man’s career, you must understand, includes four distinct stages. In your first form you are as fresh as a flower in spring, and with every glimpse of colour you are hailed by the Wordsworths in the popular papers or anointed by the weighty writers. Pretty soon, though, people begin to expect you to do something (the more demanding expect you to score runs) and complain about you. eventually I say – the years drift by and people forget about you. As you read the papers you feel like a Boomtown Rat listening to Boy George. Almost unnoticed you creep into your third stage, the most tender of them all – you are a wily old pro. You are not easily fooled, nor easily impressed. You score some runs or you don’t. N0-one notices. You don’t bother to play properly – not properly – and you accumulate more than has hitherto been your habit. Finally, as roses reluctantly shrivel, you reach your destination. You are in your closing years, appointed ‘a veteran’. 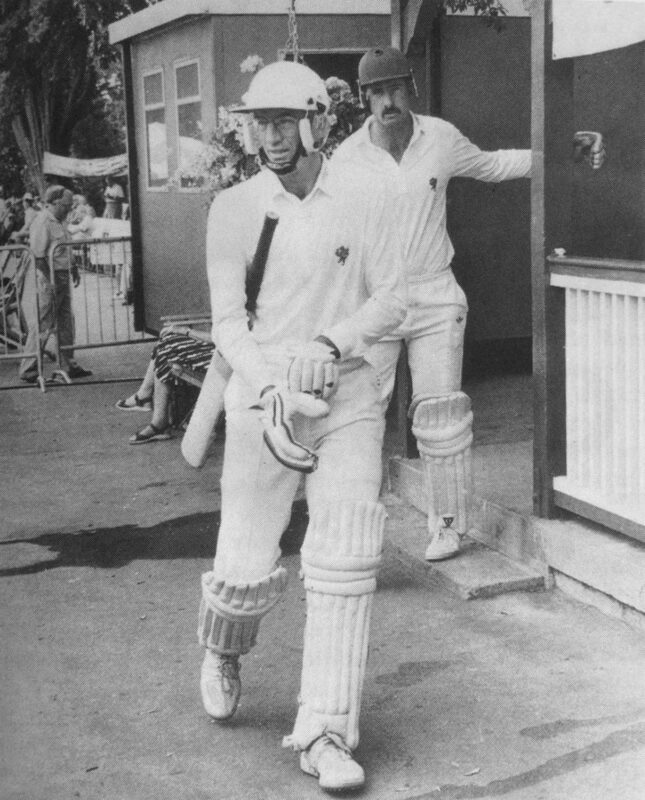 But I must describe these stages in more detail, lest any reader be contemplating a career in county cricket. It is this raw recruit, this innocent enthusiast to whom I address hereafter. A fine way to start the season! 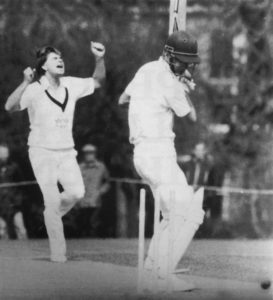 Dismissed 1st ball v Oxford University in the opening fixture of 1986. If your luck is in, stage one – the happiest, most experimental stage – will last for years as you try first this and then that. It might last say, from 17 to 22, especially if you are inconsistent so that they can call you enigmatic, unpredictable, and excuse your failings accordingly. In this period of innocence you will probably play all sorts of shots. This is good. Enjoy it while it lasts. Crack the spinners over their heads. Hook the quickies. That’s the sport. The game needs to be brightened, and you’ve no wife or mortgage. Yes, have a go, by all means. Certainly don’t be stodgy, you’re expected to show some signs of life at this stage. This is your Jazz Age, a period of wild innocence before your first bad patch, your first spell as 12th man, and your first discovery that one or two of your colleagues are only fairly nice chaps. But time wanders by, and sooner or later you will enter stage 2, in which you move from being promising (‘those whom the Gods wish to destroy they first call promising’), one of the coming young men, to being a young man in danger of being left on the shelf. You see, eventually, they notice that you haven’t done much yet, whereupon they announce that you are a failure. Do not despair, Everyone is a failure. Except those with absurdly low hopes. Nevertheless this is an alarming part of one’s career, akin to a loss of innocence. 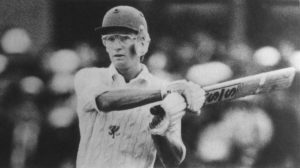 It is never quite the same again, as you prune your games of risky strokes until you have none left except a sort of shove to square leg and the odd poke though gully. The only sensible thing to do in this stage is to go the whole hog, have an absolute catastrophe of a season. If a fellow has a thin trot people will shake their heads and sigh, if he is quite shockingly woeful they will be sympathetic and say it could happen to anyone. There are only two ways to survive in this period, you must either drink a great deal (your devotion to mineral water will have disappeared with your third duck) or rail against the Gods as Lear did on the heath. Preferably, both. You might suppose, especially if you are a wine buff, that you will inevitably enter a pleasant period when your powers are at their most acute. You might suppose experience will guide you to an interlude of success as judgement finally matches ability. This is not so. You are not a bottle of wine. There is no such luxurious plateau of consistent achievement. In short you turn from a young man to a wily old pro as suddenly as a tadpole turns into a butterfly. Is that right? It doesn’t sound right. Ask Keith Fletcher. One week he was England’s brightest prospect the next a cunning old beggar who knows the ropes. Now l’ve only just been appointed a wily old pro, though my friends say l’ve been one since I was 17 (the year I stopped going down the pitch). Be that as it may, as a wily old pro you must wear old sweaters, turned-up whites and you must look canny, you must at least try to develop a shrewd demeanour. 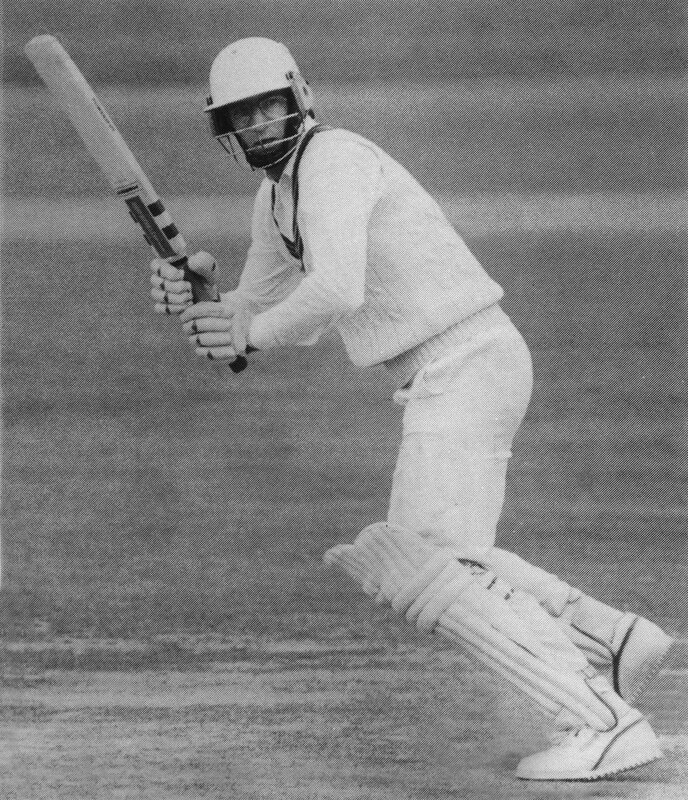 This involves subtle pitch inspections, astute study of clouds, penetrating analysis of rivals (deeper than Brian Close’s observation as Sobers walked in to bat – ‘now lads, this fellow’s a left-hander’) and fondness for being not out. Also you must pretend to take the long with the short, the rough with the smooth. Opening in 1989 with Jimmy Cook at the Weston Festival. Your stoicism, however false, must show impressionable names that you’ve seen a bit, survived a lot and are not easily shaken. Then you go home kick the dog, thrash the children (or the wife) and hit the gin. Oh yes, you must chew gum too. And if you are a spinner you must not toss the ball up quite so much. It is a proud thing to be a wily old pro. It’s like surviving a nuclear war. You must preserve the traditions. Finally you rise one morning, read The Telegraph (if you scored some runs), The Financial Times (if you didn’t) or Employment Monthly (if you haven’t for a month). You are spoken of as a ‘veteran’. This is a critical moment. It means y0u’ve played one year too many. It means your bad patch is in fact a predictable deterioration. Where have all the years gone? You don’t feel any different. But there you are, a veteran. And so at the end of each day you say you are ‘knackered’ that your feet are ‘talking’. You do not bowl into the wind. On a good pitch you don’t bowl at all. You field at first slip and stop the ball now and then. You neither chase nor dive. You bat a little lower, bowl a little slower. In truth you stop competing. You see, you’ve decided to retire with good grace. You’ve decided to enjoy your closing seasons. You sip a few pints. Bring the young ’uns up the hard way, chat to umpires (most of whom you played against) and quietly seek a pub you can run when it all finishes. You are dignified by your appointment as a veteran. Slowly your mistresses drift off to younger colleagues, and those that haven’t want to listen to Barry Manilow instead. It’s the end, and you know it. Might as well hang up the boots really. Don’t like helmets anyway, never did. Won’t miss it. Had a good run. Can’t complain. Retirement. And so the 4th stage brings the curtain down on your career. Did you enjoy it? Well no, but then what has enjoyment got to do with it? It was fun, looking back; like National Service. Or school.